Use with 3060 Snap Glide or 8120 Ball Head Carrier. Used with track models 3108, 3110, 3112, 3114, 3116, 3118, 3120, 32124, 3290, 3292, 3294, 3296, 42124, 5400, 8000. 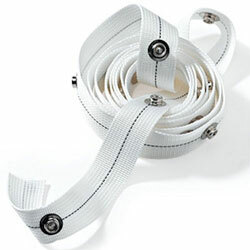 The Curtain-Mate™ 5400 track is molded of the highest quality plastic and serves as a multipurpose drapery track system with several new features, such as 9" spaced, installation holes, with additional blind holes in the underside of the track. The unique design of the 36" molded pieces allows them to be attached firmly together end on end to form any desired drapery track length. Its compact size, thin profile and decorator styling make it one of RECMAR's most popular tracks. This track can also be bent horizontally to a 15 inch radius, and can be arched vertically to 5 inches per 36 inch section of track. Curtain-MateT is installed directly to the wall or bulkhead with screws or pop rivets, and may also be additionally secured from behind. The track is 5/8" wide and projects 3/8" from the mounting surface. This track is extremely easy to install, making it popular with both professionals and Do-It-Yourself hobbyists.